After reading and loving Riley Redgate’s sophomore novel, Noteworthy, I knew I had to make it a mission to pick up more of her work. 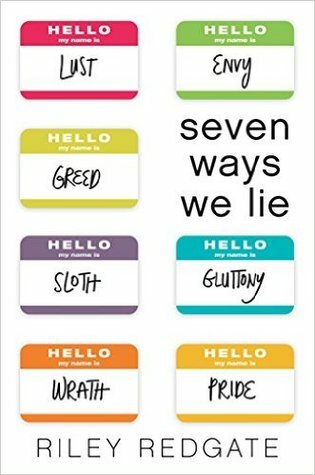 I love her writing style and unique imagination, so I was fully expecting to be blown away once again with Seven Ways We Lie. Oh my goodness, I must say that this book was a HUGE disappointment. Literally HUGE! The seven POVs did not work for me at all, not to mention that this book had next to no plot. I barely even know how to summarize this book, but I’ll try my best. Alright, so it follows the perspectives of seven very different high school students who all have secrets of their own to hide from each other. There has been a school scandal, and no one knows for sure who it involved. So, the seven students all start to unfairly blame each other and try to solve the mystery. First complaint- the SEVEN boring, forgettable, dull characters. I honestly found it so hard to keep track of them all, as Redgate made no effort to try to distinguish them or make any of their features unique. Part of my experience with these characters was that for at least half of the book, I thought that Valentine was a girl and that Juniper was a boy, when their genders were actually reversed. It was literally so annoying!! The next thing that bothered me was the plot, or lack thereof, of this book. Events were thrown all over the place with no end- it was chaos, literally and figuratively. Let’s just say that I did not have such a good experience while reading this book. Riley Redgate, I still have faith in you, especially since Seven Ways We Lie was only your debut novel and that you’ve drastically improved with Noteworthy. I still plan on picking up your books in the future- it’s just that this one didn’t do it for me. All in all, this 3-star rating that I’m handing this book is very generous. I may be swayed by how much I enjoyed Noteworthy, or maybe it’s simply that I’m in a good mood. I may just change this rating, seeing as there wasn’t much about this book that I liked. Well, maybe the morals, but those too were a jumble. If you are a fan of books with many bland POVs and lacklustre plots, then by all means, go for it and read Seven Ways We Lie. But skipping this read probably wouldn’t do you any harm. The synopsis sounds interesting but if not written correctly I can see how it could be confusing. It would be difficult with so many POV’s to keep it all straight and there is the chance for a lot of repetitive information. Thanks for the warning!